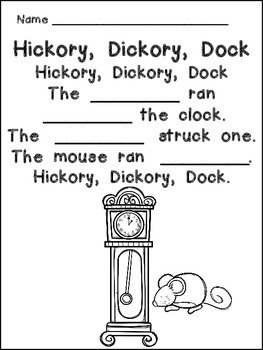 Nursery rhymes are an excellent way to build phonemic awareness and other early literacy skills in young students. This packet will make a great addition to any preschool or kindergarten classroom!! Contents include black-and-white student book, full-color poster for shared reading, black-and-white copy of poem for student copies, pages for students to draw or write about their favorite part, copies of the nursery rhyme with letters or words missing for students to complete, and full-color pocket chart cards of important words from the nursery rhyme (which can help students complete the independent activities). 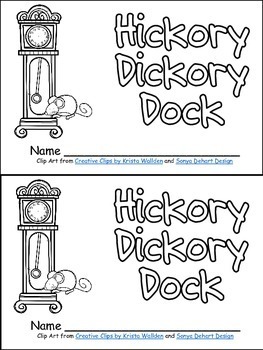 This packet focuses on "Hickory, Dickory, Dock". It has a black-and-white student book with the nursery rhyme. The book includes the same text on both the top and bottom of each sheet of paper to make copying, sorting, stapling, and cutting easy to create a class set of little books!! There is also an optional page to add to the end of the book where students can draw or write about their favorite part of the nursery rhyme. There are several different versions of this page to allow you options to meet the needs of your students. This packet also includes a full-color, full-page poster to print and use in the classroom for shared reading. There are also black-and-white versions of this full-page version of the nursery rhyme to give to students. There are full-color picture cards to place in a pocket chart for these words. 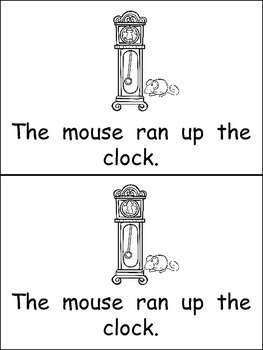 In this nursery rhyme, there are cards for these words:mouse, clock, up, and down. 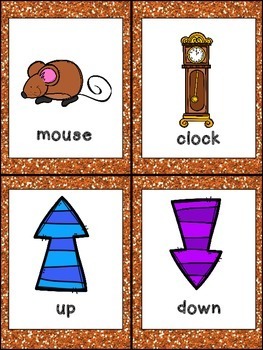 These cards can be used to help students draw or write about their favorite part and with the activity where they complete the missing words in the poem. If you like using these nursery rhyme materials, you might be interested in my BUNDLE with 10 nursery rhyme packets.